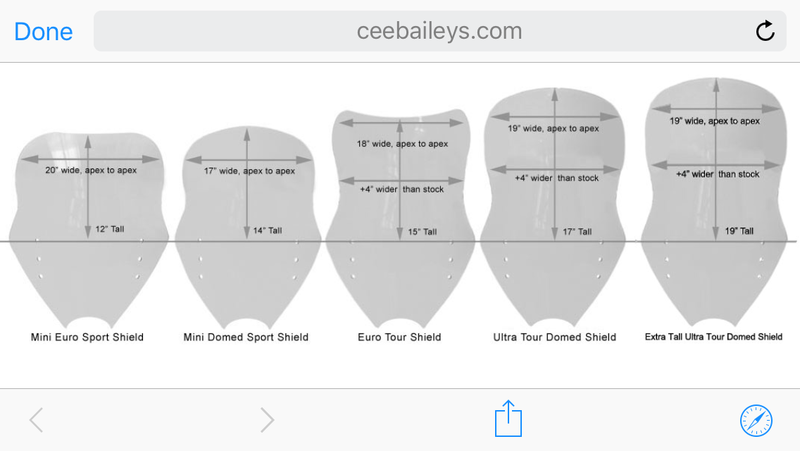 I know they no longer makes motorcycle shields and have removed them from their website. I’m trying to find out which model is 28” tall by 22” wide. And how this compares to OEM post 15 change. I bought my 14 Connie used. I was not aware at the time it had an aftermarket windshield. Turns out it's a Cee Bailey UT. I have nothing to compare with but from the looks of folks in this forum seeking then used I think I have a nice replacement for stock. It seems like a nice product. I am 5'9 and this thing gives me all the protection I need. If I were to purchase one I'd have gone with the ET for more summer breeze in the heat of So Cal. If you are more specific as to the height - from what point to what point - maybe someone could measure theirs. Is it from top to bottom or as the chart shows - from the widest point at the top mounting hole to the top.